If you're looking for a new weight-control plan, make this your final dietary switch. Low-fat menus derived from all of the food groups offer endless combinations of healthy foods that will help you maintain, lose or gain weight. The ideal meal plan provides nutrient and calorie balance that matches your health condition and activity level. Ask your doctor for help assessing your weight; then select a calorie limit, such as the 2,000-calorie average daily diet, and start planning your meals. A low-sugar cereal and low-fat milk make one of the most nutrient-dense breakfasts you can eat, with high fiber, vitamins, minerals and low calories per suggested serving. In addition to high protein, iron and B vitamins, this meal provides calcium, potassium, fiber and vitamin D -- every nutrient that the U.S. Department of Agriculture, USDA, lists as lacking in many American diets. Add dried or fresh fruit to cereal or low-fat plain yogurt, or drink ½ cup of 100-percent fruit or vegetable juice to get your vitamin C.
If you pack a lunch, build it around ideal protein sources that are low in saturated fat, such as tuna, lean deli turkey or ham, refried beans and peanut or almond butter. Whole-grain breads, tortillas and crackers, such as wheat, corn and rye varieties, are fiber-rich foods that help to control your weight by making you feel full on less food volume. Add veggies to sandwiches or choose a side salad topped with fruit. Make a habit of drinking 1 cup of 1-percent or fat-free milk with your meals instead of soda or coffee, to achieve your daily value of calcium. 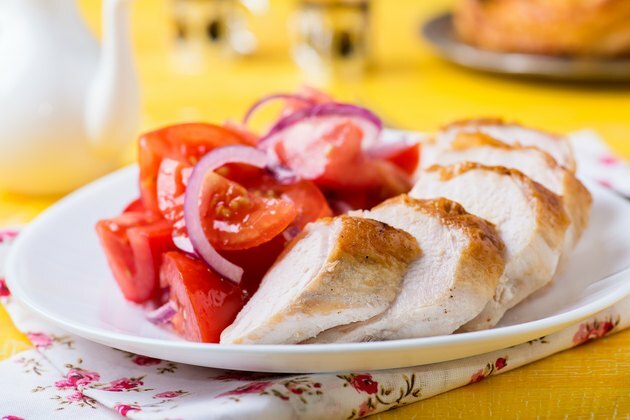 Stay lean with protein in your evening meals by choosing lean meats such as pork loin and beef sirloin and trimming the skin from chicken. To reduce your saturated fat intake, the American Heart Association suggests eating low-fat fish twice a week. To cut down on cholesterol, feature kidney, black or pinto beans as entrees. Brown rice, barley and bulgur are ideal grain foods for dinner, and cooked veggies or raw salads offer low-calorie vitamins and minerals. A fruit dessert will help you satisfy your remaining vitamin C requirements for the day.